The project entailed overlaying leading two-person home delivery expert Arrow XL’s existing concrete trailer yard in Wigan with a flexible surface course, creating a secure car park for both staff and visitors. Invited to tender for the business were several contractors, including civil engineering firm, James Callaghan Sons & Co Ltd (Calco). The project requirements initially called for 40mm of stone mastic asphalt (SMA) to be used in order to keep costs controlled. However, Calco had concerns about a 40mm layer of SMA being a sufficient depth to avoid any potential delamination between the concrete and the newly laid surfacing. The firm therefore consulted with Aggregate Industries’ specialist asphalt division, which was able to use its expertise to identify a solution that would satisfy the client’s budget for the completed works, whilst also delivering a quality finish. 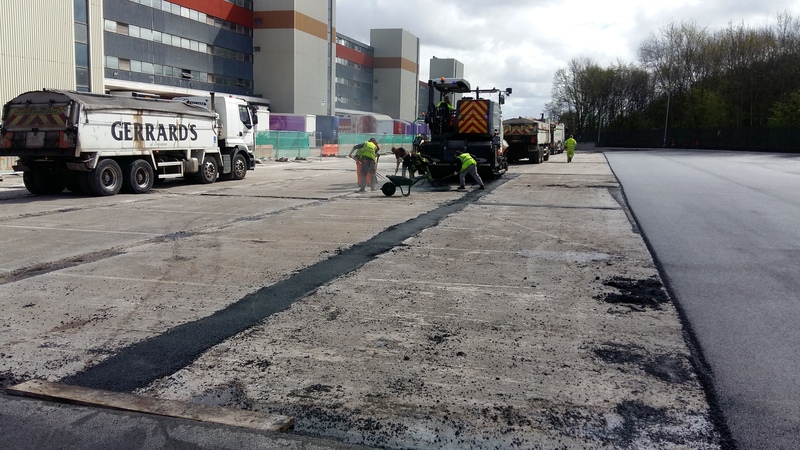 Reviewing the project requirements in detail, the asphalt team concluded that Aggregate Industries’ SuperFlex, a highly durable surface course, would be the best option to reduce the risk of reflective cracking and provide the high levels of durability required for a busy car park. Calco refined the proposal of works to also include using a spray jet paving machine which would achieve a better bond via a continuous application of a hot, bituminous tack coat as the SuperFlex was laid in a single layer straight onto the Concrete. Despite this fully tailored approach resulting in additional costs being forecast, the contract was awarded to Calco due to the quality and reliability of the finished surface meeting the high expectations of the client; a result that bears testament to the shared technical expertise of both Calco and Aggregate Industries’ asphalt division. Andrew Callaghan, Director at Calco comments: “The technical support and advice we received at tender stage from Aggregate Industries was excellent and proved instrumental in securing the job. From our client’s perspective, we had looked at potential problems and, in collaboration with Aggregate Industries, produced an improved specification which was still within the budgets of the project. Charlotte O’Connell, Territory Sales Manager at Aggregate Industries, adds: “SuperFlex is an ideal material when overlaying concrete due to its enhanced elastic properties provided by the poly-modified binder. SuperFlex also gives great results in the highway sector across the country, and is a product we are incredibly proud of.